Recent ruptures and spills are once again casting light on the risks of oil transport and the important role of pipeline monitoring and cathodic protection systems. As more details emerge about the Nexen pipeline leak which saw more than 5 million liters of crude spill on the Alberta landscape, conclusions are being drawn about the Plains All American Pipeline rupture in California. 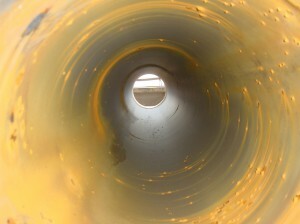 Internal pipeline corrosion. Source: Gate Inc. According to recent reports, a 15-centimetre breach of the line caused up to 382,300 liters of oil to spill, blackening beaches and creating 14.5-kilometre ocean slick. Despite company mitigation plans, corrosion is being blamed for the breach according to federal regulators. There are many ways to control pipeline corrosion. According to NACE (National Association of Corrosion Engineers) International, protective coatings and linings, cathodic protection, materials selection, and inhibitors are the four most common ways to control corrosion. In addition to technology selection, evaluating the environment in which a pipeline is located is vital for the success of any corrosion mitigation program. Another critical component of a successful corrosion mitigation program is monitoring by trained professionals. American Innovations, a provider of cathodic protection, gas measurement, compressor and general equipment remote monitoring systems for the oil and gas industry, recently released a short technical brief for professionals that discusses four common measurement terms used in cathodic protection systems and how they can impact the ability to make critical maintenance and mitigation decisions. According to the company, anyone employing cathodic protection systems should understand the resolution, range, sensitivity and accuracy of their system. Here is a brief synopsis from the brief. Resolution is the smallest digitized measurement increment that a device can represent. For cathodic protection systems, if a voltage change of 0.1 Volts is the measure to trigger an action, than the system needs to have a resolution of 0.01 V or greater. Range describes the highest and lowest measurement that a device can take and is often expressed as ± x. For example, if your AC coupon monitor can monitor a range of +-200mA, then a current of no more than +-200mA should be applied to the system. Sensitivity is the smallest signal that a particular instrument can detect on its most sensitive range. For example, if you want to measure AC interference on a pipeline using an AC corrosion monitoring device, you need to make sure your instrument is sensitive enough to be able to distinguish between the baseline/resident noise level and the signal that would trigger an alarm. This will prevent false alarms or uncertainty about whether you have a problem or not. Accuracy is about measurement uncertainty and it illustrates the expected difference between the device’s measurement and absolute traceable standards. For example, if your nominal level is at 29mA and the actionable/alert level is at 30mA, then having an accuracy in the order of +-2.58mA will not provide enough accuracy to effectively monitor the risk of AC corrosion. You can find the full technical brief here but it is important to understand that the specifications of a system are critical in selecting the right corrosion mitigation instrument and maintaining safe operating conditions. Thank you for you inquiry. Our representative for the Middle East will be in contact with you soon regarding your requirements. Thank you for reading!